For a large number of systems, less is the default utility for viewing text files. It was first released in 1984 by developer Mark Nudelman and is still going strong today. Less is a lightning fast pager and is able to open huge files without breaking a sweat. Due to it’s speed and simplicity it has become a widely popular cross-platform tool. This article will take a detailed look at the less pager and also explore some of the lesser-known features beyond the basics. You can exit Less at anytime by pressing the q key. When exploring a file you may spot something interesting that you would like to return to later. This can be achieved with the marker functionality built into Less. You can set bookmarks at specific locations within the file and quickly jump back and forth between them. Bookmark positions are defined by a single letter, which can be lowercase or uppercase. Then enter a single letter which will be saved as the bookmark reference. With the choice of lowercase or uppercase letters there are up to 52 possible marker positions. Then enter your letter to jump to the saved location. ‘ + $ will jump to the end of the file and ‘ + ^ will jump to the beginning of the file. The best way to find exactly what you are looking for is to search for it. With Less you are able to search for a keyword and it will highlight any matches for you. There are a few different search modes and various methods to navigate the results. Less will then highlight any matches for you. The display will jump to the line where the first match appears. If there is more than one match you can scroll to the next instance by pressing the n key. You can also scroll to the previous match by pressing the uppercase N key. When you are midway through a document, it might be useful to search backwards to see if you have missed anything. This can be achieved by typing the ? followed by your keyword (instead of /). This will also reverse the functionality of n and N which will now scroll in the opposite direction! The prompt will be displayed and you can then enter a search term. Another cool feature which is not widely known, is the follow mode which is similar to the popular tail -f command. With the follow mode enabled, Less will monitor a file and refresh the contents if any new data is appended. This is perfect for monitoring files such as error logs to evaluate issues in real time. The follow mode can also be initiated while viewing a file by pressing shift + F at any time within Less. There are a large amount of options to customise the functionality of Less and they can be activated in a number of ways. One method is to pass them as a command line option when opening Less. Widen search results by telling Less to ignore case sensitive searches, unless an uppercase letter is specifically requested in the search query. This will add a small column to the left which will allow space for a small asterisk symbol * to be displayed when a search result has been found. This is a nice feature which will increase the visibility of search hits. With this option enabled, the prompt will display extra information about the file which will indicate the length of the read. At first this information will be displayed in bytes, but when you have reached the end of the file and Less has analysed the full file it will then become a percentage. A little trick when first opening a file is to quickly jump to the end with G and then back again with g and you will have the percentage displayed. This is a handy display option to gauge the size of a file when reading. This will display a small column for line numbers just like your favourite text editor. With this option enabled it is also easier to visualise the line jump navigation which is available. You can quickly jump to any line within a file by typing a line number followed by g.
To permanently store configuration settings you can update the Less environment variable. 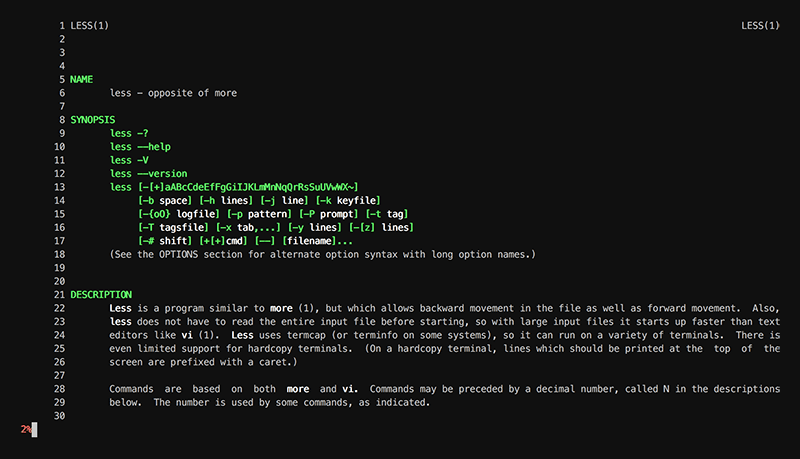 An environment variable can be added to your shell profile file such as ~/.bashrc or ~/.zshrc. The following example will set some of the configuration options to be used as the default settings. Now when Less is opened, it will automatically apply these options. In the previous screenshots you may have noticed that the manual pages are displayed in colour. This is not enabled by default but colour styles can easily be activated and customised to your preference. Defining a colour scheme can enhance the reading experience and is especially helpful for making keyword search results stand out. 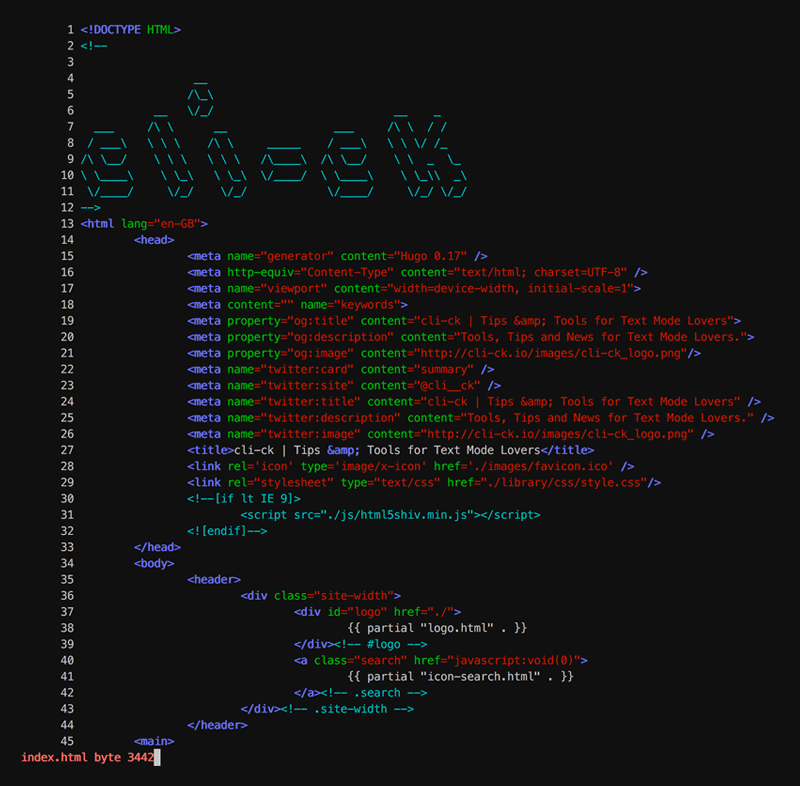 The following code snippet is an example of the colour scheme seen in the previous screenshots. To activate these settings, place this in your shell profile file (along with the environment variable). For a full explanation of how the colour settings work, check out this excellent tutorial over at TuxArena. For extra colour support, you can add syntax highlighting to Less with the GNU source-highlight tool. Less can be a surprisingly powerful tool when used beyond the default functionality. As always, there is much more to discover and this article does not cover everything you can do. This tool is now over 30 years old and incredibly, it is still under active development. Check out the official website for the latest news and releases.